I wish I lived in Seattle!!! Are you kidding, this is like pulling a random spectator from the crowd to fight the heavyweight champion! Mayo doesn’t even belong in the ring with bacon! Oh yeah, and I have a jar in my fridge! I don’t need any mayo on my BLT. Bacon will always be enough flavor for me. gooooooo BACON! (shameless plug: bacon comic on skidmorebluffs today! WOW you folks are serious about the mayo and bacon. Well I say a sammich aint a sammich without the tangy zip of Miracle Whip. PS. Keep eating that bacon, I’m a cardiologist and really appreciate what you are doing for my career. I’m sure I’ll be a billionaire by years end. Keep up the good work!!! This is so not even a contest. BACON! Pingback: BaconCulture.com» Blog Archive » hilarious! 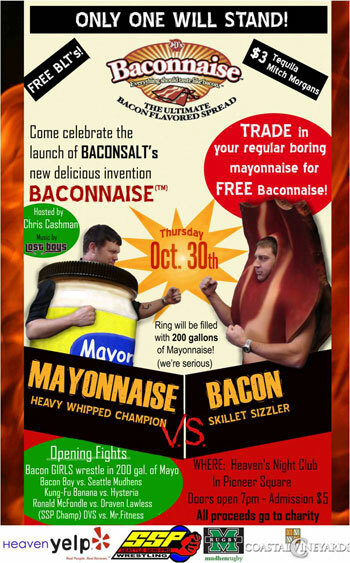 Bacon Vs. Mayo! Nooo! Why are they fighting? They’re kindred souls, for crying out loud! Love this site – if you want to hear about the dark side of bacon (I never knew there could possibly be one either) then hop on over to http://fullonredfrog.com/archives/category/bacon-of-the-month Read about the insidious taste assaults we’ve endured as members of the Grateful Palate’s Bacon of the Month Club…. I hope that it will be a big success because I like both of them very much.